We’re crossing the US-Mexico border from San Diego to Tijuana in a van that gets sent to secondary inspection for firearms. Tyche Hendricks, an experienced, modest and warm-hearted journalist specialized in immigration and criminal justice says as we’re stepping off the van: “I’m glad that they do that! Because there is a big problem of firearms going into Mexico” [And she’s right. Most of the firearms used in homicides in Tijuana, which experienced a dramatic spike in violence over the last few years, come from the US]. I’ve learned so much from Tyche over the last few weeks. I’ve learned to remain calm in the direst circumstances (Tyche had a wheel around her neck about to get burned with gasoline during the fake kidnapping we went through as part of HEFAT training, yet managed to do deep breathing and keep the rest of us not freaking out, for instance) and to question policies beyond headlines. 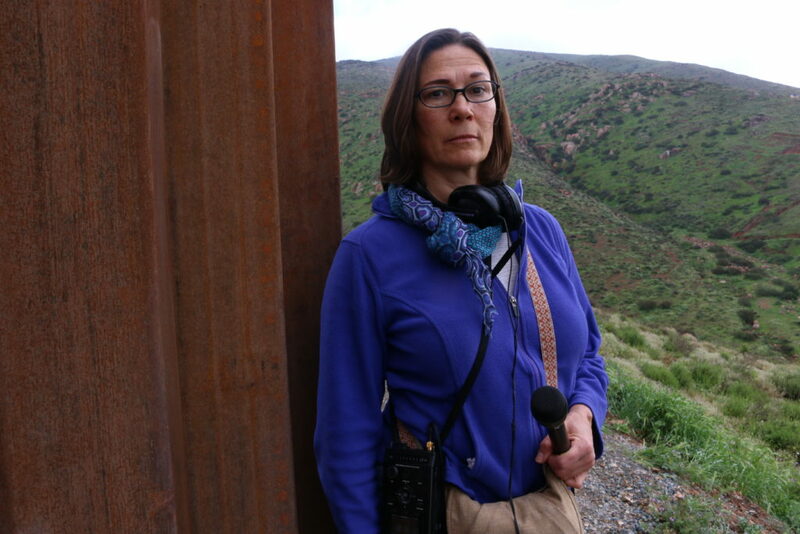 Her dogged reporting on the criminal justice system in Mexico part of this fellowship is proof of her commitment to go deep investigating social issues that relate to migration in the US. On my reading list is her 2010 book “The wind doesn’t need a passport: stories from the U.S.-Mexico borderlands”. Our conversation below has been lightly condensed. Q. Tyche, why did you want to become a journalist? A. It is not something that I grew up thinking I wanted to do. I thought I’d be a dancer, and I worked in some nonprofits after college. Then I went to Nicaragua in 1987, where I went to a language school and I worked on a reforestation project. It was the time of the Contras war and the sandinistas, and things were very polarized with the U.S. A lot of the news coming to the U.S. didn’t reflect what I was seeing on the ground. When you travel you see things with fresh eyes, and I was keeping a journal and writing letters back home. Before I had left California I lived with a couple of roommates and they agreed to take my letters, photocopy them and mail them out to a long list of my friends and family. This was before the internet. And so I wrote several letters home over the course of three-two and a half months. Looking back on it if it had been today it would have been a blog, you know, it was my proto-blog. One thing led to another and back in San Francisco I did a couple of journalism internships and I did a graduate masters degree in Latin American studies as well as journalism. My first love was radio but at the time that I graduated there were more jobs in newspapers so I took a job in a newspaper and then some years went by and the newspaper jobs were drying up and I found the job at a radio station [KQED public radio]. It’s been 9 years. I got hired to be an editor for a government and politics project. And I ran our elections coverage for several election cycles. I was doing immigration on the side because that’s really what I know best and I love. Q. Why were you interested in immigration? A. I guess it came out of the Latin American studies. I was one of the few Spanish speakers in our newsroom. San Francisco is a very big immigrant receiving metropolis. There’s a lot of Asian immigrants but also a good number of Mexicans and Central Americans, too. I’ve been focused on immigration coverage at KQED for about four years, but for the past two years I’ve been in charge of this team for immigration and criminal justice. Q. What do you think it’s exciting about covering immigration today as compared to in the past? A. Well, this is not exciting but I’ve been doing this for long enough that I see the same stories are coming around again, like build the fence, build the wall… you know it’s like cycles of being more welcoming to immigrants, the politics being more restrictive… I’ve seen three attempts of a comprehensive immigration reform bill that have failed to pass through Congress, so I think there’s a challenge in trying to find fresh ways to tell stories. There’s a challenge in finding the right balance between the context of the policy side of it and the human side of it. One thing I’d really love to do is to do some deep reporting at this point in Central America about what’s the real cause that is pushing people to migrate, what are the dynamics, and what might help respond to that, which is kind of like the judicial reform story that I’m trying to do here in Mexico. It’s just like looking at deeper social issues and how they relate to migration in the United States. I think it’s hard to be in a U.S.-based newsroom and find the resources to go and do that sort of thing, so that makes this trip a great opportunity and a great luxury.